Thank you to the Mount Joy Rotary and Rotary Club of Manheim for partnering with us to contribute $2,500 each ($7,500 total) for this used farm equipment! Starting this spring it will help the produce growing efforts at The Wittel Farm. 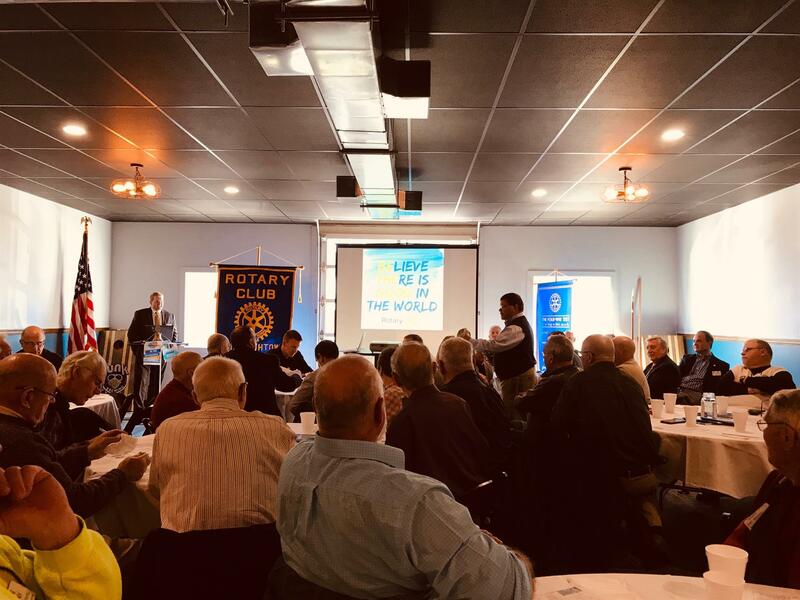 Another $7,500 was matched by Rotary District 7390 through a Multiclub District Grant for a total of $15,000 to help feed the hungry in our region! 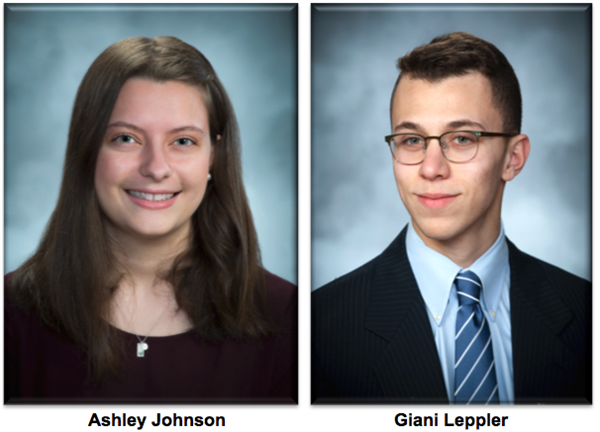 March 11, 2019- Elizabethtown Area High School seniors Ashley Johnson and Giani Leppler were named the Elizabethtown Rotary Club’s students of month for March. Johnson and Leppler were honored for their high academic achievement and extensive involvement in school and community service activities. Johnson is the daughter of Mark and Christa Johnson of Elizabethtown. She is member of the prestigious National Honor Society. Johnson holds leadership positions in numerous school programs. She is secretary for the Class of 2019, secretary for the Model United Nations club, and Kiwanis Club liaison for the Key Club. She is also active with the band and chorus, French Club, and serves as an intern with Brittany’s Hope. Johnson is the recipient of the Chairman’s Choice Historical Crisis Committee award. Johnson is active in the community where she does volunteer work for the Masonic Village. She is employed by the Elizabethtown Public Library. Johnson plans to attend college and obtain degrees in International Relations and French. Leppler is the son of Chris Leppler of Elizabethtown and Kathy Amaro of Lancaster. He is member of the prestigious National Technical Honor Society. Leppler is active in numerous school activities including Chess Club and Book Club, as well as being a member of the soccer team. In the community, Leppler is employed at Lucky Ducks. Leppler plans to attend college and major in Biology or Pre-Med with a minor in engineering. 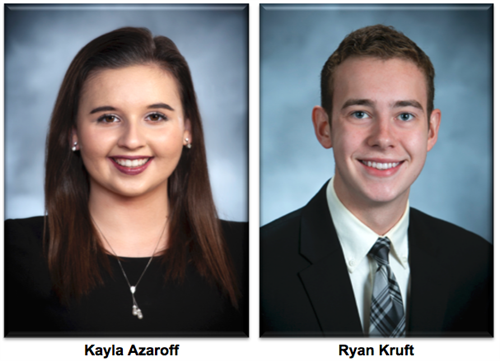 February 14, 2019- Elizabethtown Area High School seniors Kayla Azaroff and Ryan Kruft were named the Elizabethtown Rotary Club’s students of month for February. Azaroff and Kruft were honored for their high academic achievement and extensive involvement in school and community service activities. Azaroff is the daughter of Andre and Linda Azaroff of Mount Joy. She holds leadership positions in numerous school programs. She is president of student council, vice president of the Model UN club, and publicist and librarian for the high school chorus program. She has been a participant in the theater program during her years at high school, holding roles in both the spring musical and fall play programs. She has earned the excellence in theatre award from the high school and the Spirit of Theatre Award from the Hershey Theatre Apollo Awards program. Azaroff is active in the community where she does volunteer work for the Susquehanna Stage Company. She was Elizabethtown Fair Queen runner-up in 2017 and 2018. Azaroff plans to attend college and obtain a degree in political science with a minor in communications. She hopes to join the PEACE Corps and ultimately become a campaign manager. Kruft is the son of David and Corrie Kruft of Elizabethtown. He is member of the prestigious National Honor Society. Kruft is an accomplished musician. He has been named to the Pennsylvania Music Educators Association District Band and the Lancaster-Lebanon Music Educators Association County Band. He is a member of the marching, concert, and jazz bands, as well as the orchestra and concert choir. In addition to his contributions in music, Kruft is active with the theater department performing in both fall plays and spring musicals. He is a member of Key Club, helps out with Mini-THON, and is co-president of the German Club. In the community, Kruft is a regular volunteer at the Water Street Rescue Mission. He has also participated in mission work through the Christian Endeavor Service in North Carolina and the Greater Love Church in Washington D.C.
Kruft plans to attend college in an urban setting and study business. New Location of Friday Meeting! 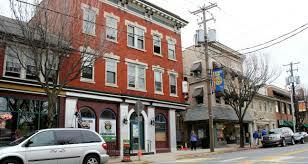 Our Friday meeting has moved to Funk Brewing at 28 S Market Street in downtown Elizabethtown. We meet in their new banquet room in the back. Parking can be found in the municipal lots in the back or across the street. Street parking may also be available. Make sure to pay your dime to the parking meters! The First Friday of February every year ... A celebration of food, beverage, music and fellowship. 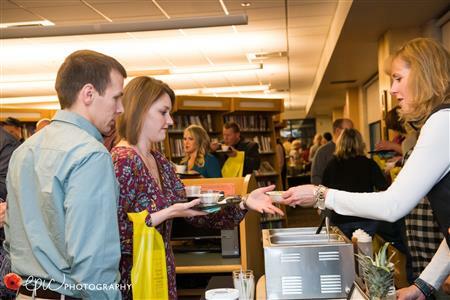 This year's event is Friday, February 1, 2019 at the Elizabethtown Public Library. Savor food samplings to satisfy and excite your palate from the finest restaurants in the region. General Information - NOW SOLD OUT! Tickets $35 can be purchased online at tinyurl.com/twlc2019. Physical tickets can be purchased at the library for $38. Event was sold out in late January last year. 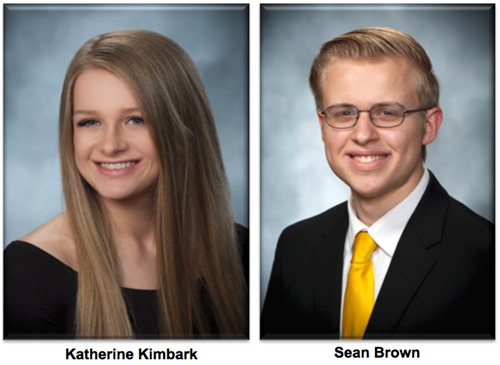 January 14, 2019- Elizabethtown Area High School seniors Katherine Kimbark and Sean Brown were named the Elizabethtown Rotary Club’s students of month for January. Kimbark and Brown were honored for their high academic achievement and extensive involvement in school and community service activities. Kimbark is the daughter of Craig and Kristine Kimbark of Mount Joy. She is a member of the prestigious National Honor Society. Kimbark is involved in numerous school programs including Key Club, Mind and Body Club (co-founder and co-president), Mini-THON, and Peer Tutoring. She is captain of the girls’ volleyball team and a member of the track and field team. Kimbark is active in the community where she does volunteer work for the Susquehanna Stage Company and the local Toys For Tots initiative. Kimbark plans to attend college and obtain a degree on Biochemistry in order to pursue a career in pharmaceutical research. Brown is the son of Franklin and Caroline Brown of Elizabethtown. Brown earned the distinction of National Merit Scholarship semifinalist and is vying to be a finalist later this spring. He is member of the prestigious National Honor Society and has been named an AP Scholar. Brown is an accomplished musician. He has been named to the Pennsylvania Music Educators Association District and Regional Orchestras, as well as the Lancaster-Lebanon Music Educators Association Orchestra. He is a member of the Hershey Symphony Orchestra. He placed first in both the Hershey Symphony and Allegro Orchestra of Lancaster Young Artists Competitions. In the community, Brown is active with the Libertarian Party of Lancaster County serving as their secretary and editor-in-chief of their newsletter. 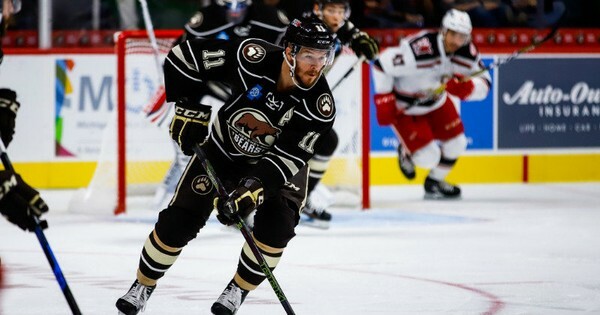 Brown plans to attend college and obtain a degree in economics with a minor in music. $$$ goes to help offset cost of Christmas Tree shed. EASTERN MOBILE WASH is donating the suite, the tickets, and suite parking. 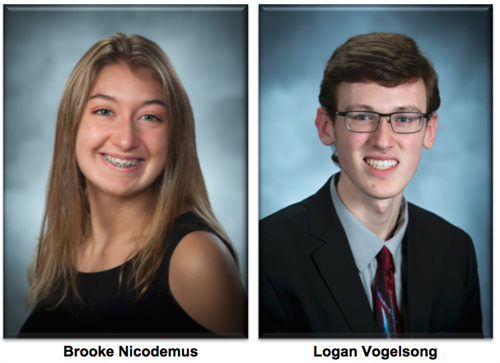 December 14, 2018- Elizabethtown Area High School seniors Brooke Nicodemus and Logan Vogelsong were named the Elizabethtown Rotary Club’s students of month for December. Nicodemus and Vogelsong were honored for their high academic achievement and extensive involvement in school and community service activities. Nicodemus is the daughter of Michael and Terese Nicodemus of Elizabethtown. She is a member of the prestigious National Honor Society. Nicodemus is involved in numerous school programs including Key Club, Bible Club, and Roots and Shoots. She is also a member of the cross country, swimming, and track & field teams. Nicodemus is active in the community where she does volunteer work for the Key Club and Bible Club. Nicodemus plans to attend college and explore the world. Vogelsong is the son of Kathleen Keiper and William Vogelsong of Elizabethtown. He is member of the prestigious National Honor Society. Vogelsong is an accomplished musician where he has served as percussion leader for the band and performed with the LLMEA All-County band. Vogelsong is the president for the high school’s science club. As a member of the mathematics and computer programming competition team, he has represented EAHS at the Dickinson College Interscholastic Math Competition and the Bloomsburg University Computer Programming Competition. Vogelsong also serves as a tutor in the areas of chemistry and calculus. 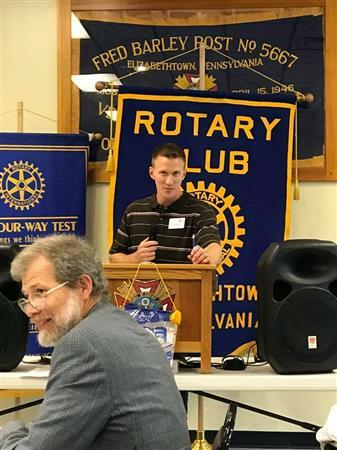 In the community, Vogelsong is active with DeMolay of Elizabethtown, performs with the Hershey Symphony and Bainbridge Community band, and volunteers at the Masonic Village. Vogelsong plans to attend college and obtain a degree in chemical engineering or material science/engineering with a minor in mathematics or computer science. We are pleased to announce that during the 2018 Pints for Polio week we raised $3,177.60. With the match from the Bill and Melinda Gates Foundation, this will help provide $9,532.80 to the ongoing effort to eliminate polio forever. A huge thank you to our local breweries Moo-Duck Brewery, Funk Brewing Etown, and Cox Brewing Company without whom this could not happen! Thanks to Bruce Environmental & Response Management for again sponsoring the music and thanks to the businesses that donated raffle prizes! Of course, thanks to all of you who came out to support this effort! Cheers! The Christmas season is officially upon us! 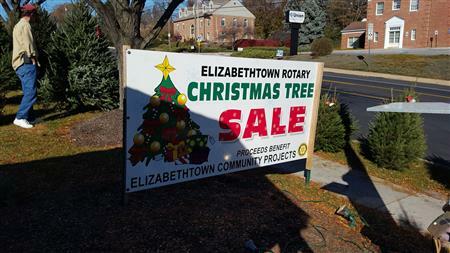 The Elizabethtown Rotary Club is once again selling Christmas trees now through Wednesday, December 19th in the parking lot of the Elizabethtown, PA GIANT Food Store at 1278 S. Market St. Elizabethtown. Thanks to our generous sponsors, every dollar from every tree sold goes right back to the various greater Elizabethtown community projects our Rotary Club supports. We have almost 600 premium, high quality Douglas and Fraser Fir Christmas trees available ranging in sizes from small "table top" trees to 9 foot. Last year we sold out early so hurry and get yours before its too late! 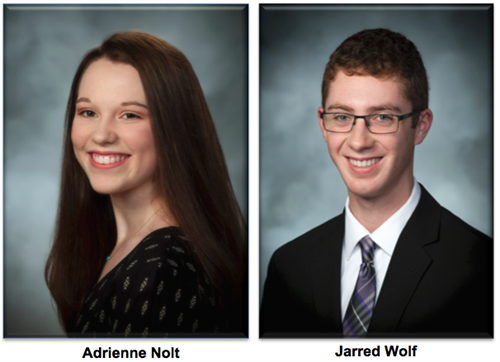 December 6, 2018- Elizabethtown Area High School seniors Adrienne Nolt and Jared Wolf were named the Elizabethtown Rotary Club’s students of month for November. Nolt and Wolf were honored for their high academic achievement and extensive involvement in school, and community service activities. Nolt is the daughter of Michael and Carol Nolt of Elizabethtown. She is a member of the prestigious National Honor Society. Nolt garnered Commended Student Status in the 2018 National Merit Scholarship Program. She has also been honored as an AP Scholar. Nolt is active with Key Club, the Newspaper Club where she serves as editor, and as a peer tutor. She is a member of the concert choir earning selection to the county chorus festival the last two years. Nolt is active in the community where she volunteers at the Susquehanna Dance Center. She is the recipient of the Rotary Club’s Youth Leadership Award in 2018. Nolt plans to attend a four-year university and obtain a degree in dance and a yet to be determined second major. Wolf is the son of Jeff Wolf of Mount Joy and Julie Weimer of Elizabethtown. He is member of the prestigious National Honor Society. Wolf is active with the high school’s marching, symphonic and jazz bands, as well as the symphony and pit orchestras. He is a member of Key Club and works with the high school’s Literary Magazine. In the community, Wolf performs with the Elizabethtown College’s Symphonic Band, Mixed Winds Ensemble, and Saxophone Ensemble. He is also a member of the Masonic Village Encore Band and Bainbridge Band. Wolf plans to attend a music conservatory for classical saxophone performance and music education. 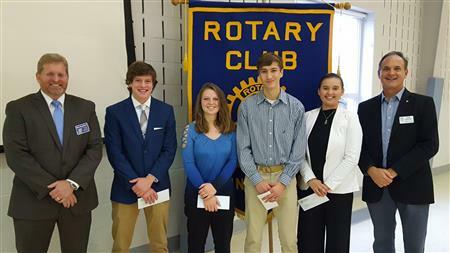 We are please to announce the winners of the Etown Rotary Club 4-Way Speech Contest held Tues. Nov. 6 at Etown HS. They will be moving on to the Mid-level competition Thurs. Nov. 15 at Lebanon HS. 4-Way Speech Contest Chair Don Grabowski will present all 4 of them with a check at our Nov. 30 Friday luncheon. 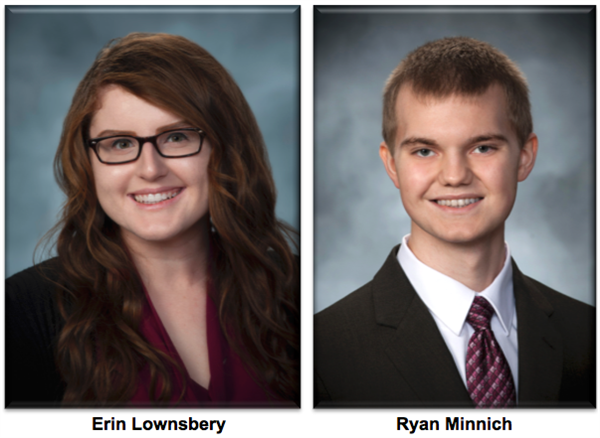 October 17, 2018- Elizabethtown Area High School seniors Erin Lownsbery and Ryan Minnich were named the Elizabethtown Rotary Club’s students of month for October. Lownsbery and Minnich were honored for their high academic achievement and extensive involvement in school, and community service activities. Lownsbery is the daughter of Brian and Linda Lownsbery of Elizabethtown. She is a member of the prestigious National Honor Society where she garnered commended student status. Lownsbery holds leadership roles in numerous school programs including club leader for the Bible Club and section leader for the percussions in the marching band. She is also active with Key Club, concert choir, and the high school’s theater program where she performed in the spring musicals The Sound of Music and Curtains. Lownsbery is active in the community where she works at the Willowood Swim Club. She’s also active with her church LCBC – Manheim Campus. Lownsbery plans to attend a four-year university and obtain a degree in nursing. Minnich is the son of Sherri Minnich of Elizabethtown. He is member of the prestigious National Honor Society. Minnich is active with the high school’s National History Day Program, Model United Nations, and the Quiz Bowl and We the People Teams. Minnich is a member of the orchestra where he has been selected to the Lancaster-Lebanon Music Educators Association County Orchestra. He also serves as a tutor for algebra. In the community, Minnich performs with the Hershey Symphony Orchestra. He also volunteers packing food bags and stocking shelves at Mount Joy Helping Services. Minnich plans to attend college and major in philosophy with a minor in either linguistics, political science, or economics. 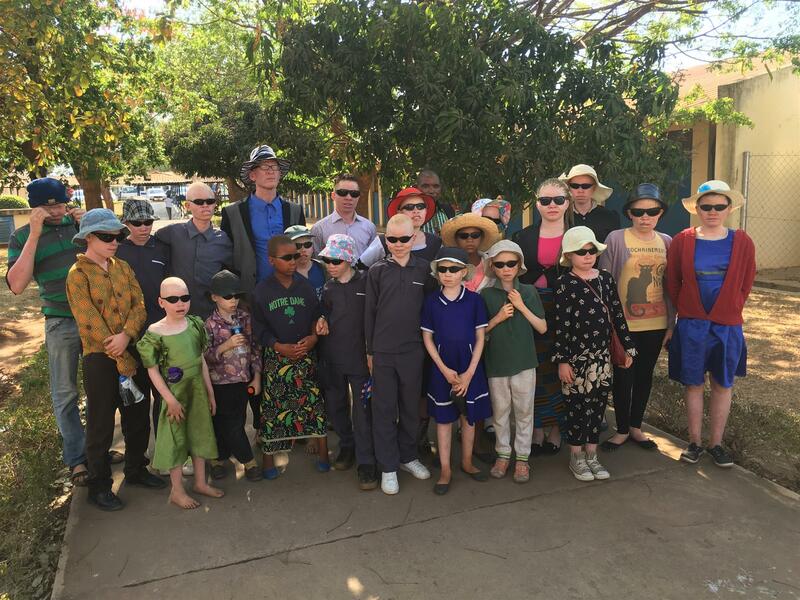 One small part of the recent Eye Care Vocational Training Team to Malawi was providing low vision care to people with albinism. 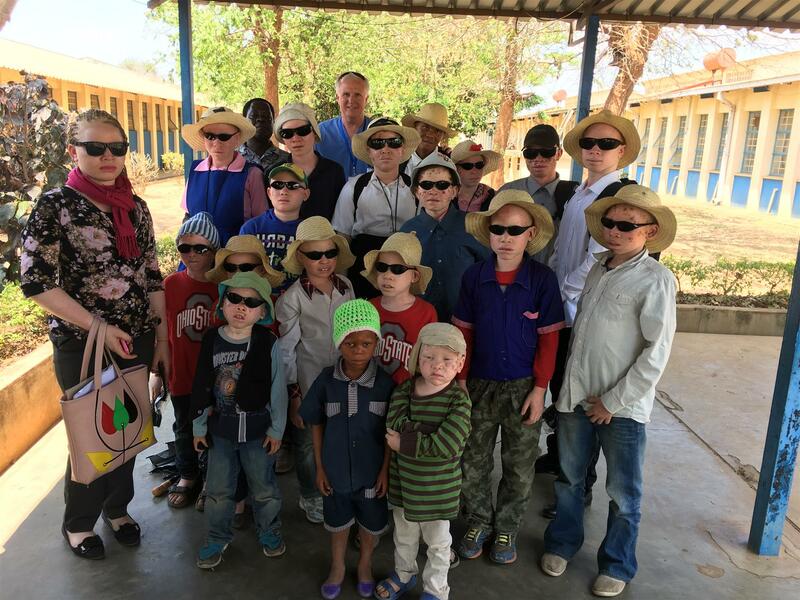 Here are photos of a few of our patients who received photochromatic spectacles, sunglasses with a unique tint just for them, sunscreen, and a telescope to improve distance vision. Rotary Club of Lancaster, with partner clubs Elizabethtown, Mechanicsburg North, Lancaster Penn Square, and Northern Lebanon County, sponsored this Global Grant project that included training of local eyecare practitioners in the diagnosis and treatment of glaucoma, strabismus, albinism, diabetes, and a few other maladies. Ten Rotarians from our district, including Elizabethtown Rotarians Ken Wolfe and Joe Rebman , were joined by Danish colleagues to complete this amazing project. 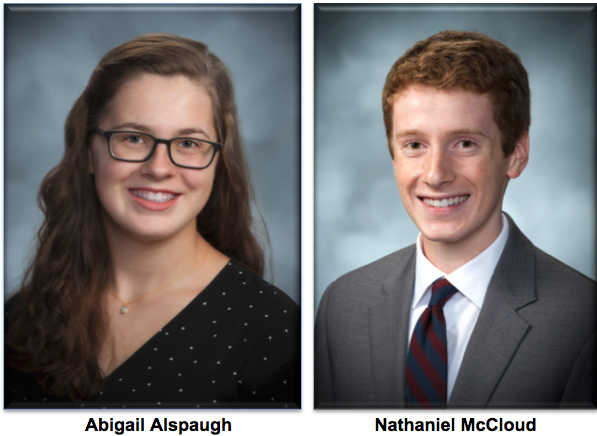 September 24, 2018- Elizabethtown Area High School seniors Abigail Alspaugh and Nathaniel McCloud were named the Elizabethtown Rotary Club’s students of month for September. Alspaugh and McCLoud were honored for their high academic achievement and extensive involvement in school, and community service activities. Alspaugh is the daughter of Eric and Wendy Alspaugh of Elizabethtown. She is a member of the prestigious National Honor Society. Alspaugh has held leadership roles in numerous school programs including librarian for the orchestra and Key Club secretary. She plays the viola in the orchestra, is a member of the high school swim team, sits on the Prom Planning committee, serves as a tutor for chemistry, and helps with the spring musical tech team. Alspaugh is active in the community where she volunteers with Helping Hands serving breakfast to the homeless in Harrisburg, PA. She also volunteers as a group leader at her church’s vacation bible school. Alspaugh is employed by the Masonic Village where she works at the Farm Market. Alspaugh plans to attend a four-year university and obtain a degree in the field of science. McCloud is the son of Jeff and Elizabeth McCloud of Elizabethtown. He is member of the prestigious National Honor Society. McCloud is active with the high school newspaper, where he serves as editor. He also takes part in the Model United Nations program, is a member of the quiz bowl team, and runs cross country for EAHS. McCloud earned awards in the 2017 and 2018 MIT INSPIRE competition in the area of political science. In the community, McCloud plays trombone in the Elizabethtown College jazz band and orchestra programs. He works at the Willowwood Swim Club. McCloud plans to attend college. The Family of Rotary Committee has scheduled a bus trip to Washington DC on Thursday August 23rd to see the Phillies vs. Nationals baseball game. 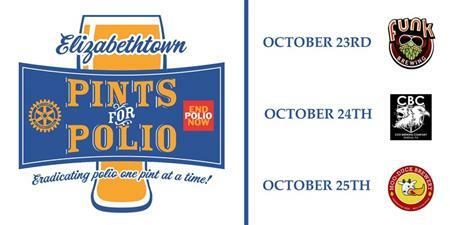 Utilizing the National's "Strike Out Polio" program, $5 of every ticket will be donated to Rotary's PolioPlus . If we have enough interest, we will be traveling in style using the themed "End Polio Now:" motorcoach from Bailey Coach. The bus will leave Elizabethtown at 8:45 am for the 1 pm game. Tickets are $75 each. Ticket sales are now open online at https://register.etownrotary.org/ for the August 23rd bus trip to Nationals Park. 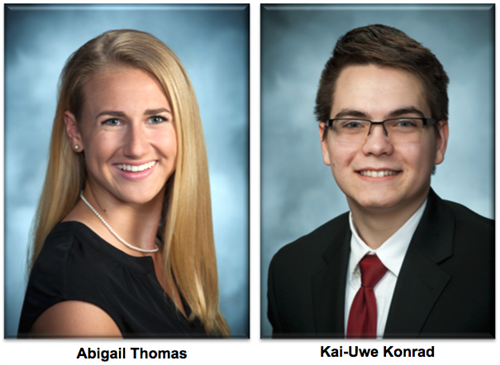 Elizabethtown Area High School seniors Abigail Thomas and Kai-Uwe Konrad were named the Elizabethtown Rotary Club’s students of month for June. Thomas and Konrad were honored for their high academic achievement and extensive involvement in school and community service activities. Thomas is the daughter of Ed and Luann Thomas of Elizabethtown. She is active in numerous school programs. She has held leadership roles with Mini-THON all four of her high school years culminating as chairperson her senior year. She has been involved with student council and the orchestra programs. She was team captain of the field hockey team her junior and senior years having earned both defensive and coaches pick for MVP as well as Lancaster-Lebanon League all-star status. Thomas is active in the community. She volunteers at the Tel-Hal Retirement Home and with the GEARS youth field hockey program. Thomas plans to attend Slippery Rock University and major in criminal justice while at the same time continue her field hockey career. Konrad is the son of Kai-Uwe and and Gwen Konrad of Elizabethtown. He has been inducted into the prestigious National Honor Society and was named a Commended Student in the highly respected National Merit Scholarship program. Konrad is active in numerous school activities including the quiz bowl and math/computer programming teams, Future Business Leaders of America, Habitat for Humanity, the Gay Straight Alliance, and the Newspaper Club. After graduation, Konrad plans to attend Penn State University to attain a degree in mathematics. 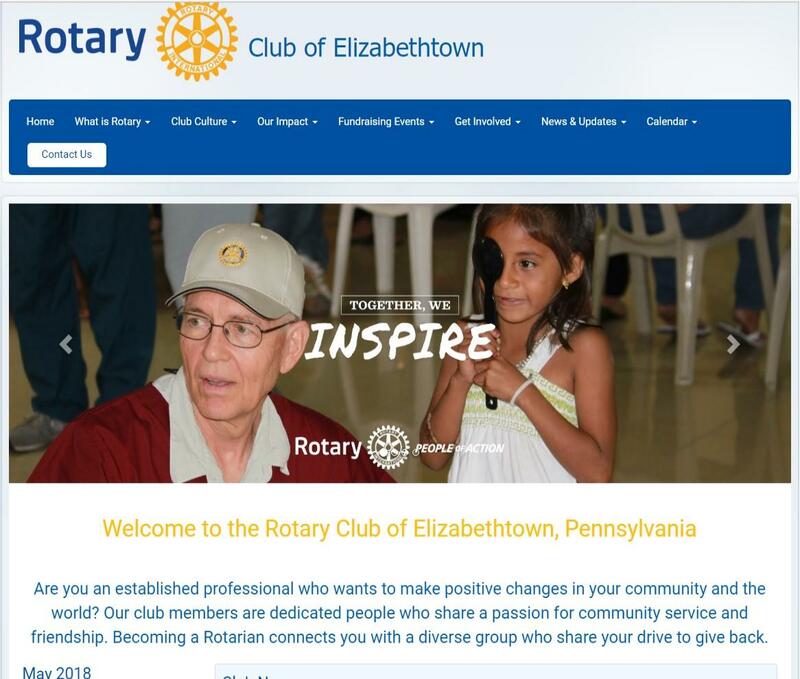 The Elizabethtown Rotary Club and President Tim Haak released the club's new website today. The new site is hosted on the Clubrunner platform which will tie Elizabethtown Rotary's site to Rotary District 7390 and Rotary International. 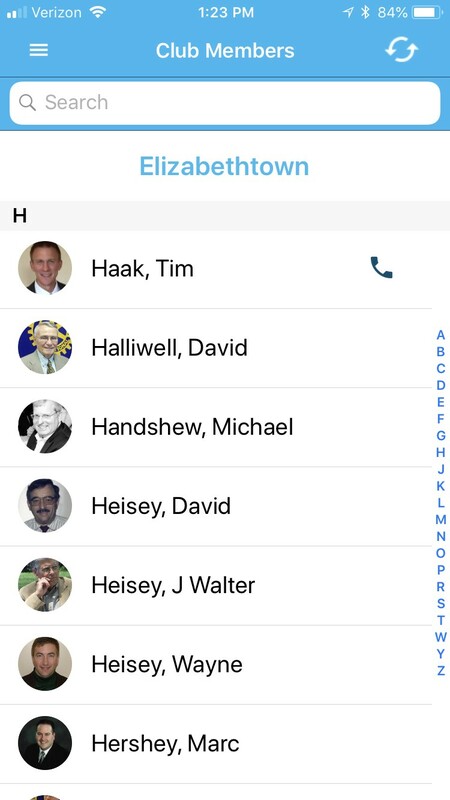 Clubrunner also provides a phone app which will enable members to easily access important information like the club's member directory and the calendar of events.
. Member directory and Events calendar on phone app. 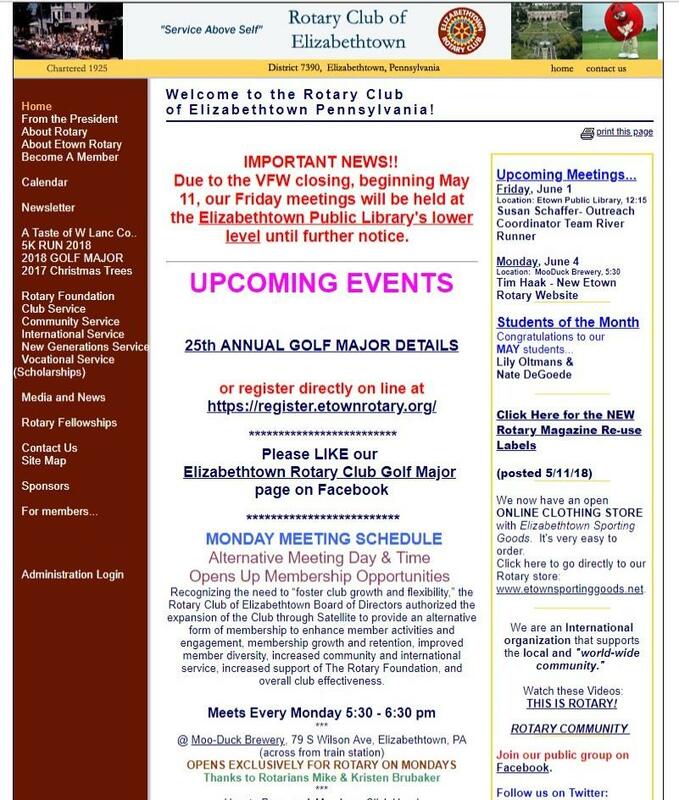 The current domain name of www.ElizabethtownRotary.org will still be used. A shortened domain of etownrotary.org also connects to the site. The old site hosted by Clubwizard has been active since 2007 . Upgrading the club's website was one of President Haak's goals for his 2017-2018 presidential year. 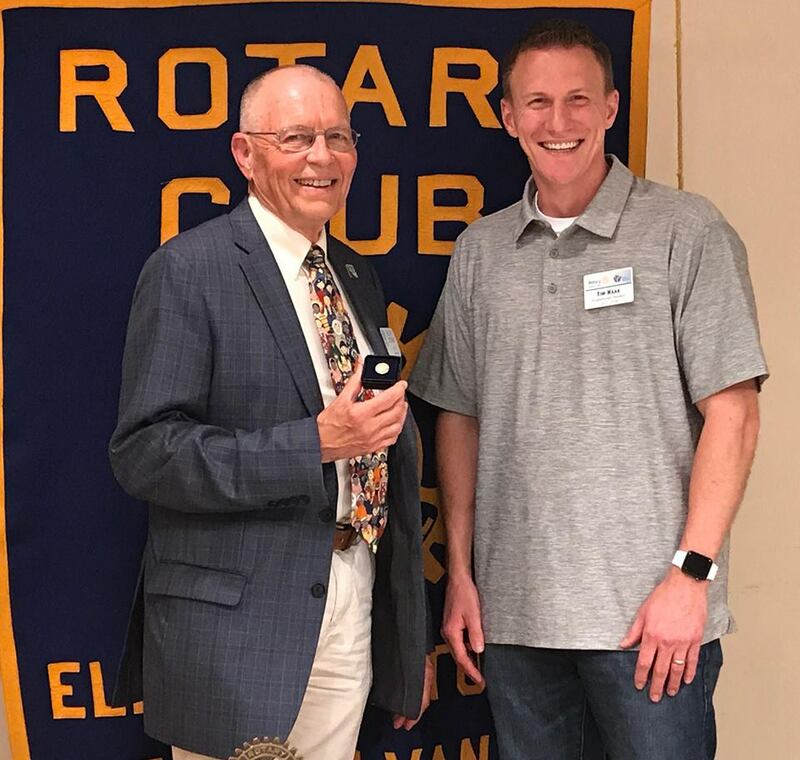 President Tim Haak had the honor of presenting Brenda Barlet with her PHF+1 Paul Harris Fellow pin and Ralph Detrick with his PHF+3 Paul Harris Fellow pin at recent meetings in May. Also at the Monday meeting on May 21st, David Ritter received his PHF+3. 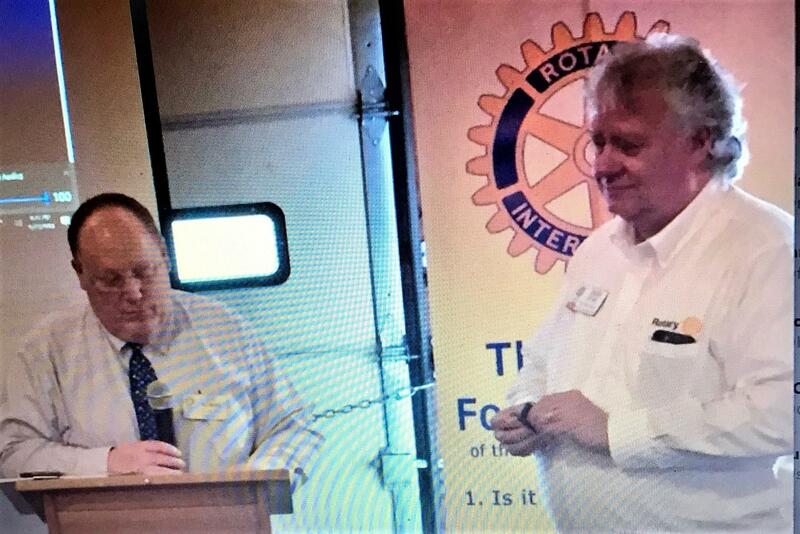 A Paul Harris Fellow has given $1000 to the Rotary Foundation. If a plus number appears after a name, it indicates additional multiples of $1000. Thank you to Brenda, Ralph, and David for their support of the Rotary Foundation and for doing good in the world. 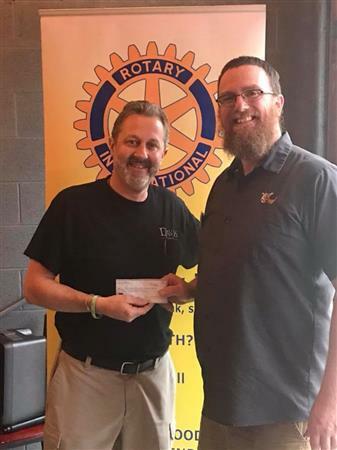 Mike Brubaker, Owner/Brewer of Moo-Duck Brewery, presented Dan Brill, Monday Meeting Chairperson a check for $300. 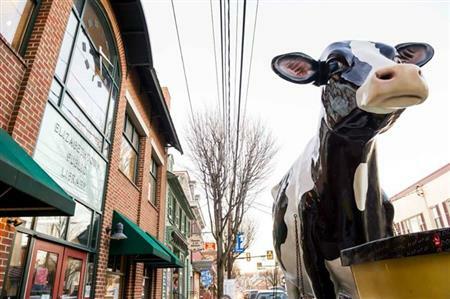 Moo Duck selects a different charity to donate to every four months. The organization selects a beer during that period and for every beer that is ordered, Moo Duck donates .50 cents to that charity. Thanks to Moo Duck and thanks everyone for drinking Purple Carp or as we call it, Rotary Red! 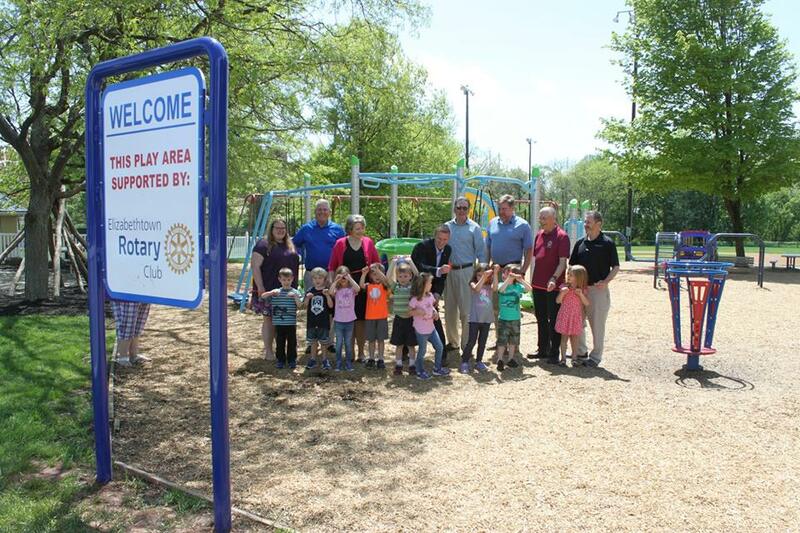 On Friday, May 11th some members from our club officially dedicated this addition to the GEARS Poplar Street Playground. This project was paid for with funds from the Elizabethtown Rotary Club, Rotary District 7390 via a matching grant and GEARS. Special thanks to the kiddos who lended a hand! 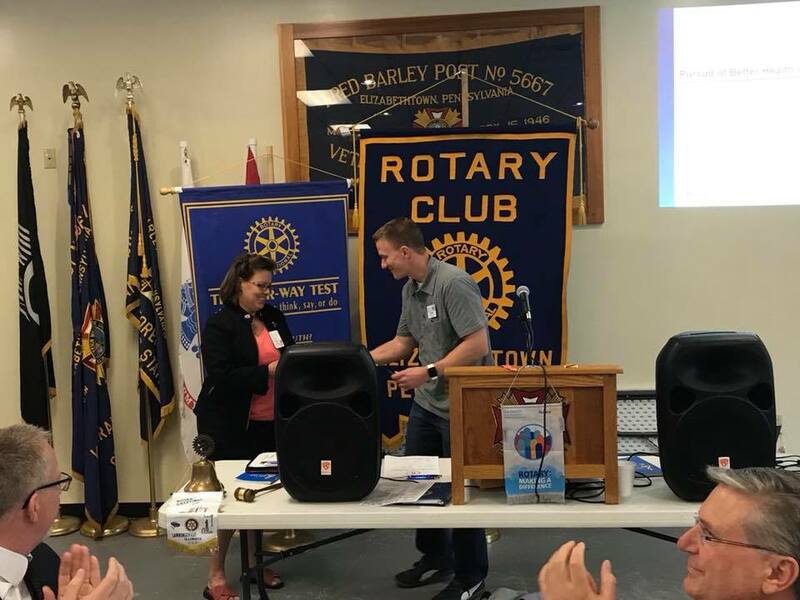 Elizabethtown Area High School seniors Lily Oltmans and Nathaniel DeGoede were named the Elizabethtown Rotary Club’s students of month for May. 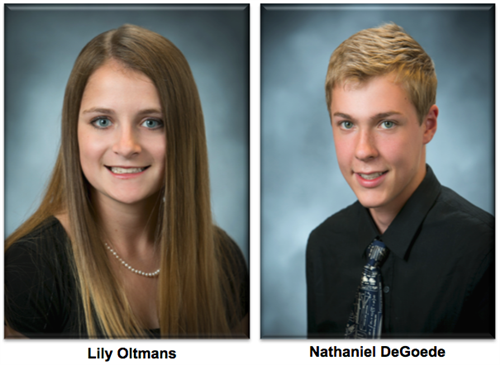 Oltmans and DeGoede were honored for their high academic achievement and extensive involvement in school and community service activities. Oltmans is the daughter of Andrew and Tara Oltmans of Elizabethtown. She has been inducted into the National Honor Society. Oltmans is active in numerous school programs. She is a member of Key Club, co-editor for layout of the school newspaper, a member of the computer programming and mathematics competition team, and is member of the band and orchestra ensembles. Oltmans is active in the community. She volunteers with the local Paint-the-Town event, as well as with Eggstravagansa sponsored by GEARS. She is employed by the Willowood Swim Club as a lifeguard and at the Masonic Village Farm Market as an orchard assistant. Oltmans plans to attend Shippensburg University and major in computer engineering. DeGoede is the son of Kurt and Beth DeGoede of Mount Joy. He has been inducted into the prestigious National Honor Society. DeGoede is active in numerous school activities including cross country, track and field, jazz band, the competition science team, the math and computer competition team, and the Model UN program. In the community, DeGoede is employed by New Covenant Properties in their maintenance department. He is also active with his church serving as a sound, light, and video team volunteer. After graduation, DeGoede plans to attend Valparaiso University to attain a degree in either computer or electrical engineering. Beginning Friday May 11th, the meeting location for the Elizabethtown Rotary Club's Friday gathering will be in the lower level of the Elizabethtown Public Library. The library has graciously opened their doors on Fridays until the board can establish a permanent Friday meeting location. From this week's Elizabethtown Advocate... "Elizabethtown’s Veterans of Foreign Wars post is closing its building. The veterans group notified the Elizabethtown Rotary Club, which meets at the post building on Fridays, that it would have to find a new place to meet. Elizabethtown Rotary President Tim Haak said the VFW told him the last time the post building would be available for a Rotary meeting would be Friday, May 4. Elizabethtown’s Kiwanis Club also meets in the building." 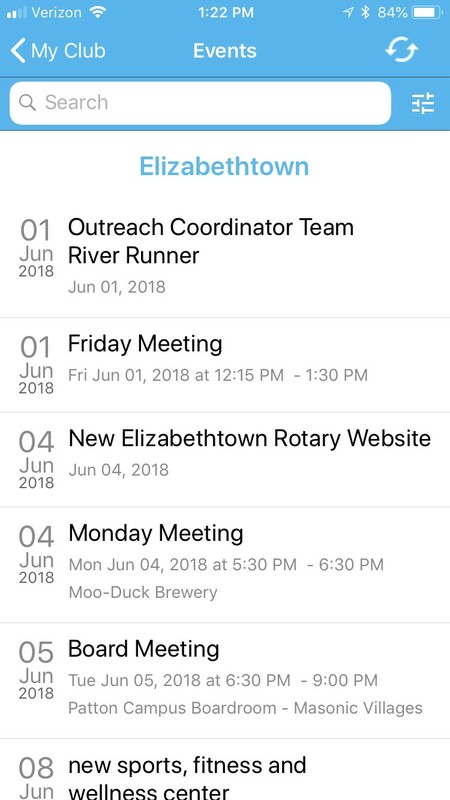 Beginning May 11, the Friday meeting of the Elizabethtown Rotary Club will be held in the lower level meeting room of the Elizabethtown Public Library on a temporary basis. President Haak is working with the board to establish a new permanent meeting location for the Friday meeting. 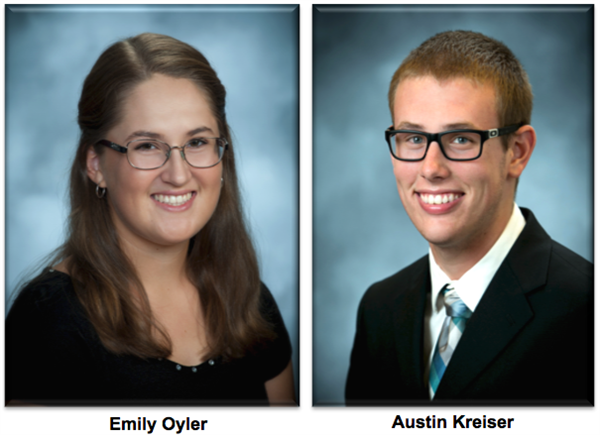 Elizabethtown Area High School seniors Emily Oyler and Austin Kreiser were named the Elizabethtown Rotary Club’s students of month for April. Oyler and Kreiser were honored for their high academic achievement and extensive involvement in school and community service activities. Oyler is the daughter of Ronald and Beth Oyler of Elizabethtown. She has been inducted into the National Honor Society. Oyler holds leadership positions in numerous school programs. She is co-layout editor for the school newspaper, stage manager for the musical, captain of the girls’ tennis team, and manager for the boys’ tennis team. She is also active with Key Club, concert choir, and the bible club. Oyler is active in the community. She assists the local Chamber of Commerce as part of our high school’s internship program. She also helps with the junior team tennis program. Oyler plans to attend Kutztown University and major in communication design. Kreiser is the son of Eric and Erica Kreiser of Elizabethtown. He has been inducted into the prestigious National Honor Society. Kreiser is active in numerous school activities including FFA and the ski club. He is a member of the boys’ volleyball team. For his work with FFA, Kreiser has received numerous honors including an FFA Keystone Degree, the wildlife management award, the manufacturing technology award, and two third place finishes as a member of the Pork Bowl and Ag Mechanics teams. In the community, Kreiser is active with the Boy Scouts of America having earned its highest honor of Eagle Scout. He also shows pigs at the Elizabethtown Fair and PA Farm Show. After graduation, Kreiser plans to attend Penn State University to attain a degree in Veterinary and Biomedical Sciences with the goal of becoming a large animal/food animal veterinarian. Rotary is a service organization that helps build goodwill and peace in the local community and throughout the world. The main objective of Rotary is service in the community. Rotarians develop community service projects that address many of today's most critical issues, such as children at risk, poverty and hunger, the environment, illiteracy, and violence. 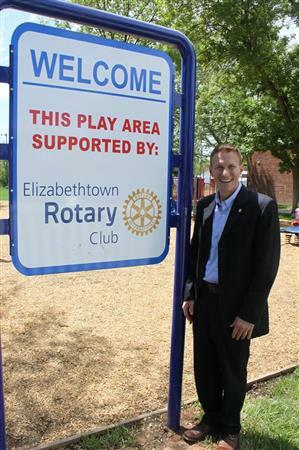 The Elizabethtown Rotary Club has supported the Elizabethtown youth for many years and in many ways. Some of the Rotary programs have been; Rotary Student of the Month, Pfautz Scholarship, Student Loans, Text-A-Tip notification program, Byrnes Health Center Field Trips, America’s Promise, Junior Achievement (JA) and others.